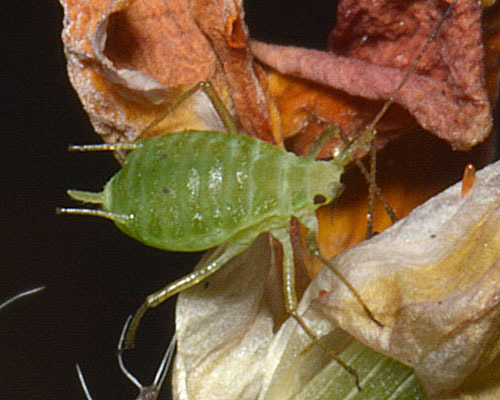 Apterae of Acyrthosiphon loti are green, or rarely pink, often with indistinct greyish transverse stripes. 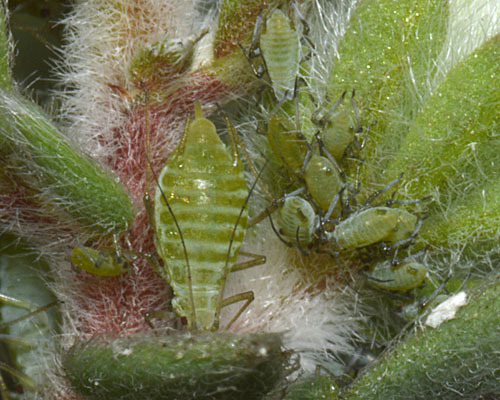 Their antennae and siphunculi have dark apices but the individual antennal segments do not have dark apices. The antennal terminal process is 3.2-4.0 times longer than the base. The antennal tubercles of Acyrthosiphon loti are low and smooth and strongly diverging. The median frontal tubercle is low and flat. Acyrthosiphon loti antennae are 0.9-1.0 times the body length. Acyrthosiphon loti siphunculi are 0.20-0.25 times the body length and 1.2-1.6 times the caudal length. The siphuncular diameter at the midpoint is 1.0-1.4 times the diameter of the hind tibia at its midpoint. The body length of Acyrthosiphon loti is 1.7 to 2.9 mm. The pictures below are micrographs of an apterous adult in alcohol. The alate has rather indistinct marginal sclerites and pleural intersegmental sclerites. The third antennal segment has 3-19 rather large rhinaria, and the siphunculi are thinner than in the apterae. The apterous male Acyrthosiphon loti is greyish red with a very slender body. 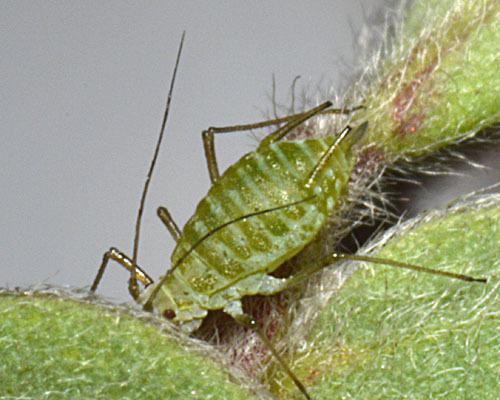 The green trefoil aphid does not host alternate. Sexual forms occur in autumn and males are apterous or alate. It feeds on various members of the pea family (Fabaceae) especially trefoils (Lotus, Anthyllis and Hippocrepis) and lucerne (also known as alfalfa, Medicago sativa). Acyrthosiphon loti is found in Europe, eastward to Turkey, and has been introduced to Argentina. We have found quite large colonies of the green trefoil aphid not uncommonly on birds foot trefoil (Lotus corniculatus) by roadsides in East Sussex. 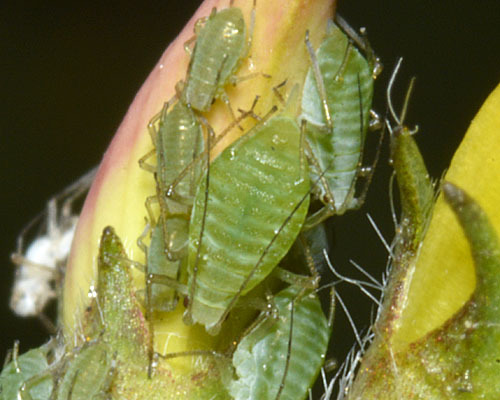 Aphids were clustered on the developing seed heads. Not surprisingly the colonies attracted various aphid predators especially hoverfly larvae (Syrphidae). The picture below shows a syrphid egg deposited near an Acyrthosiphon loti colony. 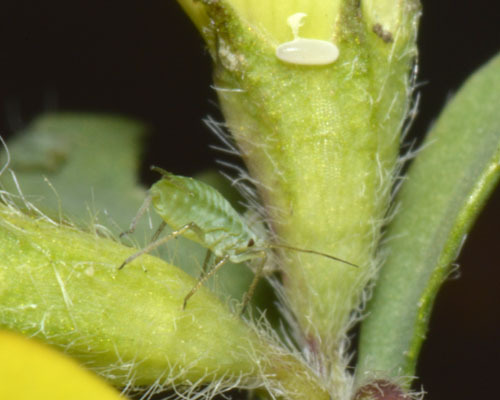 Some of the Acyrthosiphon loti were in mixed species colonies with (what appear to be) the common and highly polyphagous foxglove aphid, Aulacorthum solani - see picture below. 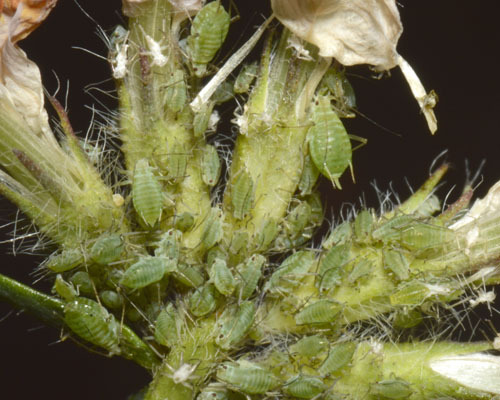 We have also found aphids that key out to Acyrthosiphon loti on Dorycnium hirsutum bushes (ornamental hairy canary flower, see pictures below). Ortego & Durante (2003) report the discovery of Acyrthosiphon loti on cultivated lucerne (Medicago sativa) for the first time in Argentina and South America. 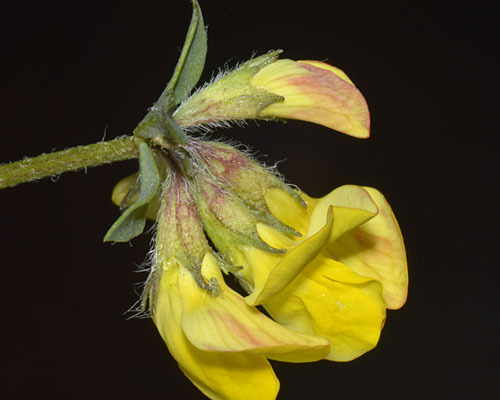 Blackman & Eastop list 13 species of aphid as feeding on birds foot trefoil (Lotus corniculatus) worldwide, and provide formal identification keys. 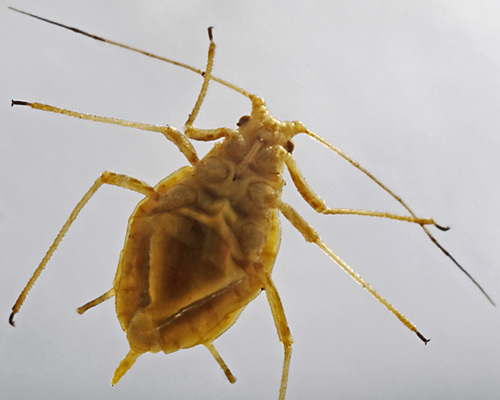 Of those aphid species, Baker (2015) lists 10 as occurring in Britain: Acyrthosiphon loti, Acyrthosiphon pisum, Aphis craccivora, Aphis fabae, Aphis loti, Aphis lotiradicis, Aulacorthum solani, Megoura viciae, Nearctaphis bakeri and Therioaphis trifolii. 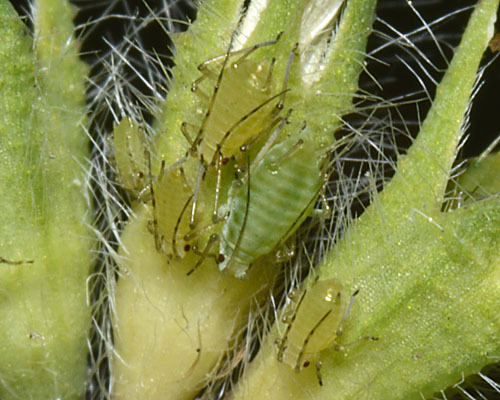 Blackman & Eastop list 24 species of aphid as feeding on lucerne (alfalfa, Medicago sativa) worldwide, and provide formal identification keys. 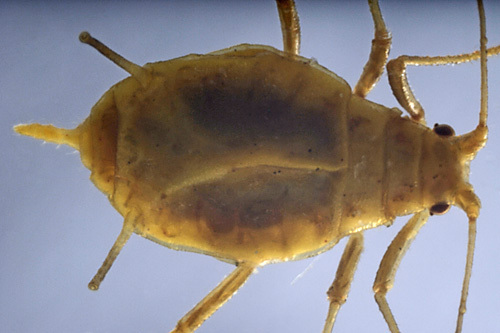 Of those aphid species, Baker (2015) lists 17 as occurring in Britain: Acyrthosiphon loti, Acyrthosiphon pisum, Aphis craccivora, Aphis fabae, Aphis gossypii, Aphis medicaginis, Aulacorthum solani, Brachycaudus helichrysi, Macrosiphum euphorbiae, Megoura viciae, Myzus ascalonicus, Myzus ornatus, Myzus persicae, Nearctaphis bakeri, Smynthurodes betae, Therioaphis riehmi and Therioaphis trifolii.